Boris Delaide (University of Liège, BE) gave a presentation of his recent study of nutrients in aquaponics and their impact on lettuce production. Here are some key takeaways. Most of the nutrient was lost due to the water changes and the sludge removal (solid fish waste removed from the system). 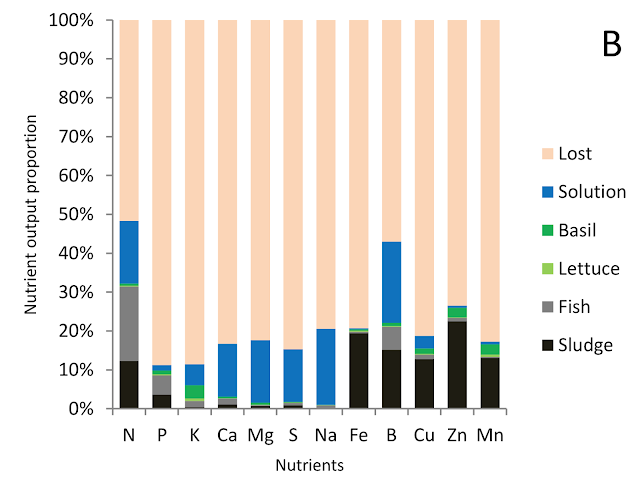 Aquaponic systems need to take advantage of the nutrients locked in the sludge. Adding a digester to mineralize the solids is a good place to start. Despite all of this, Aquaponics is as productive as an optimized hydroponic system with a much higher concentration of nutrients. This echoes the findings of others such as Nick Savidov. 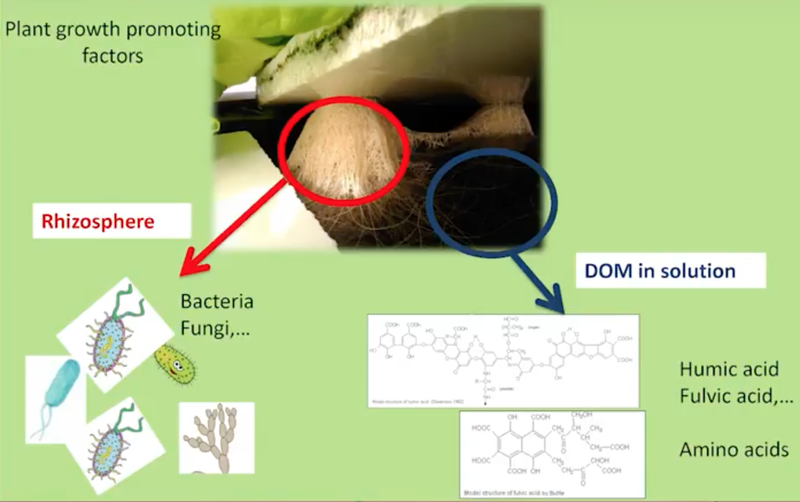 His hypothesis is that aquaponics performs as well as hydroponics despite having less nutrients because of the microflora in the rhizosphere which help the roots in absorbing nutrients more efficiently. The second reason may be the dissolved organic matter may be feeding the plants directly or promoting the uptake of nutrients. 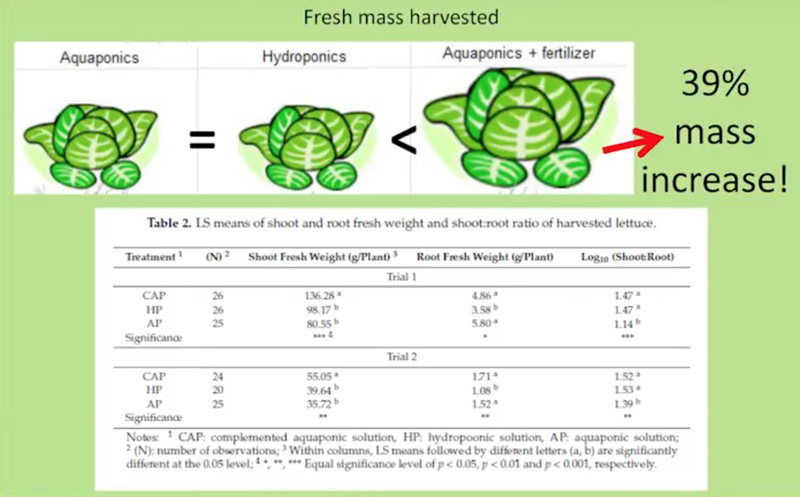 He also found that if the nutrients in the aquaponic system were supplemented so that they were equivalent to the hydroponic system, the plants would grow at a much faster rate than the hydroponic system. 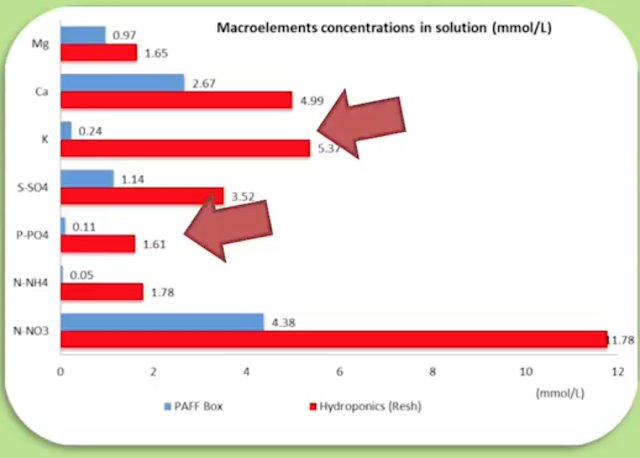 Aquaponic solution supplemented with nutrients equalling what would be found in a typical hydroponic system, produced 39% more plant mass than the hydroponic system. This is due to the more efficient uptake of nutrients in the aquaponic solution. Finally, he looked at different methods of digesting the sludge to release the nutrients that were locked in the solids. More work needs to be done in this area, but it is promising.